We’ve all experienced it, or heard about it. A team spends weeks or months developing a strategic plan, and nothing happens with it after the glossy document gets printed. Why does this great new plan just sit on the shelf gathering dust? Business scholars over the past two decades have been researching why plans fail to be implemented.1 The overarching theme of their conclusions: people resist change. How do we address this challenge? Through a structured plan for execution. 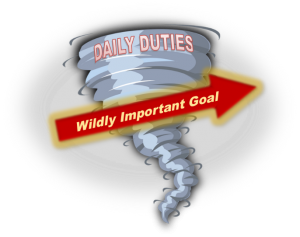 Your team needs to commit to the plan, yet they are busy with their daily duties (the “whirlwind”) and they don’t take time to focus on the strategic plan. Select one or two “wildly important goals” (WIG) that drive your strategic plan and can be measured and tracked. Identify the activities that lead to achieving the WIG(s), ones that your team can influence. Create a compelling scoreboard: simple, visible to the team, shows the lead and lag measures, and tells immediately if you are winning. Establish a weekly cadence of accountability in which each team member commits to working on one or two of the lead activities as well as reports on the efforts toward the WIG. 15 minutes to identify and establish your WIG from your strategic plan. If you need two WIGs, spend another 15 minutes on the second one. 15 minutes per WIG to list all of the leading activities required to meet your WIG. 15 minutes to determine how you will show (scoreboard) the team’s progress toward leading activities and WIG and where it will be displayed. 15 minutes per week – the same day/time each week – for the accountability meeting. We facilitated a strategic plan for one of our clients a year ago. After following up with them to see their progress, they reported that the leadership team implemented a few goals but felt they needed our help to really drive the plan throughout their organization with all employees. They embraced 4DX and are starting to see results. This works! Try it, and let me know how it works for you. If you need help in setting up your 4DX plan, the Alber Enterprise Center can show you how. Call 740-725-6325. Govindarajan, V., & Trimble, C. (2010). The other side of innovation: solving the execution challenge. Boston: Harvard Business School Publishing. Gudmundsson, H., Ericsson, E., Tight, M., Lawler, M., Envall, P., Figueroa, M., et al. (2012). The role of decision support in the implementation of “sustainable transport” plans. European Planning Studies, 20(2), 171-191. Hahn, W., & Powers, T. (2010). Strategic plan quality, implementation capability, and firm performance. Academy of Strategic Management Journal, 9(1), 63-81. Kotter, J. (1996). Leading change. Boston: Harvard Business School Press. Larian, L., Day, M., Backhurst, M., Berke, P., Ericksen, N., Crawford, J., et al. (2004). What drives plan implementation? Plans, planning agencies and developers. Journal of Environmental Planning and Management, 47(4), 555-577. McChesney, C., Covey, S., & Huling, J. (2012). The 4 disciplines of execution: achieving your wildly important goals. New York: Free Press. Posted in Leadership Development, Organizational Capacity Building	Tagged asset building, leadership, Strategic Planning, teamwork	Bookmark the permalink. The scoreboard is an important element. Think about how much information you can glean when you sit in the driver’s seat of your car and just glance at the gauges. Oil, gas, speed and warning lights in just a second or two that can guide your travels. Setting up a scoreboard of the WIG’s you want to make some headway on, putting it on your agenda with updated efforts take time to set up; but help all of us stay focused. And, we learn to glance at this scoreboard during every meeting. Thanks, Myra!